President Hugo Chavez has told Toyota and other foreign automakers to share their technology with local businesses or they will be told to leave the country. Chavez gave the ultimatum to Ford, General Motors, Toyota and Fiat during a public ceremony in the Venezuelan capital late Wednesday night. 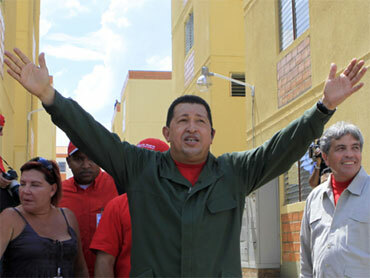 If his demand isn't met, Chavez said, "I invite you to pack up your belongings and leave. I'll bring in the Russians, the Belorusians, the Chinese." The Wall Street Journal reports that most of Chavez's criticism was directed at Toyota. Chavez said the government would also apply quotes on the types of vehicles produced and that he ordered his trade minister to inspect the Toyota plant to see if it's making enough all-terrain "rustic vehicles" which are needed in the countryside because they are converted into minibuses. "They'll have to fulfill [the quotas], and if not, they can get out," Chavez said, according to the Journal. "We'll bring in another company." The Journal reports that Toyota hasn't decided how to respond to the demands yet and the company is in contact with the Japanese embassy in Venezuela, the Venezuelan embassy in Japan and Japan's foreign ministry. Chavez's government has recently nationalized major companies in the metals, cement, oil, coffee and electricity sectors as it aims to build a socialist economy. Fiat-controlled Chrysler, GM, Ford, Toyota, Mitsubishi, Mack and Iveco all produce vehicles in Venezuela. Last year, auto plants in Venezuela produced 135,042 cars and trucks. But Venezuela's currency controls have the industry struggling to obtain the cash they need to import enough parts and pay down debts.